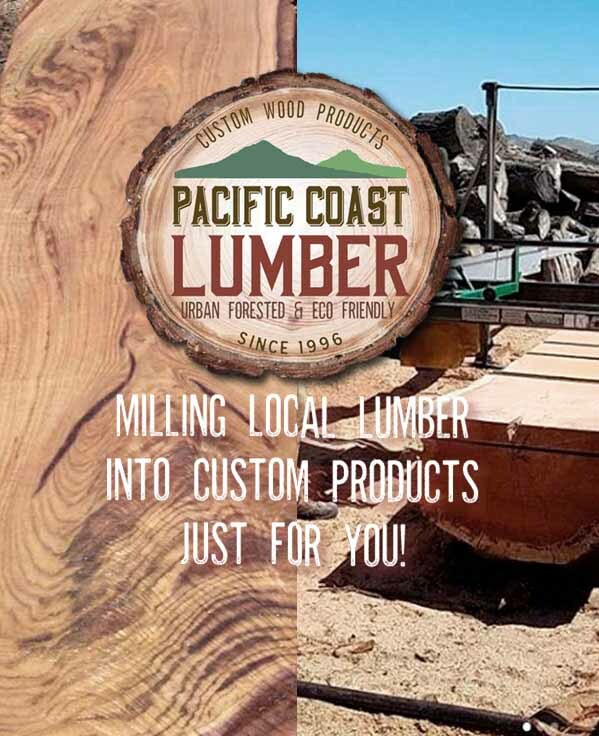 Pacific Coast Lumber – Milling Local Lumber into Custom Products Just for You! 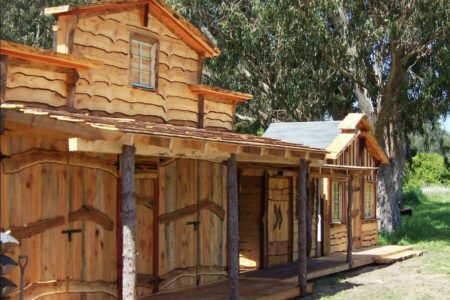 Pacific Coast Lumber (PCL) is much more than the largest eco-friendly urban forested lumber mill in California – we also build unique home and lifestyle products and provide specialty services that can only be found here at PCL. We take pride in our stewardship of the environment. We focus on using local resources to their best and highest use while reducing the carbon footprint at the same time. 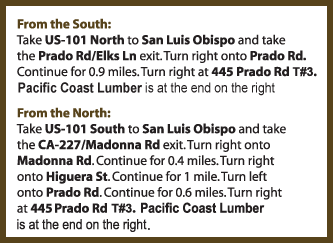 The urban forested lumber we mill comes from trees primarily in San Luis Obispo County. These trees either fell on their own (like storm downed trees) or needed to come down due to an arborist’s determination (for a variety of reasons) and are at the end of their lifecycles. 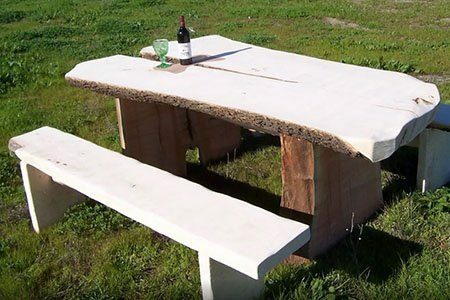 We then mill these trees into useful raw material such as large slabs, beams or any board dimension you need. There are numerous tree species that grow in San Luis Obispo County, such as Ponderosa Pine, Walnut, Blue Gum, Hickory, Elm, Sugar Pine, Maple, Red Gum, Cypress, Redwood, Radiata Pine, Sycamore, Acacia, Ash, Oak and Monterey pine. 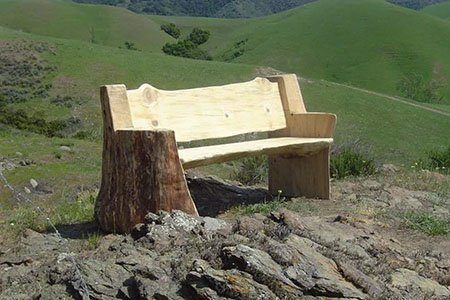 At PCL, we strive to preserve the beauty and vitality of these trees by re-purposing them into beautiful, long-lasting, well-designed products. 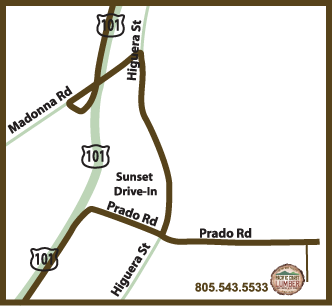 Please look through our products and services below and call 805.543.5533 or stop by the shop at 445 Prado Road in San Luis Obispo for more information. Commodity lumber business material has been getting thinner and thinner over the years. For example, a typical 1×6 inch redwood fence board “used to be” 1 inch thick, then 3/4 inch thick and now is at 9/16 inch thick. Here at PCL, we can mill virtually any dimension of lumber you specify, you are the boss! With the large variety of local lumber species we offer, you can select the best material for your purpose, from hard and soft woods to bug and rot resistant varieties. 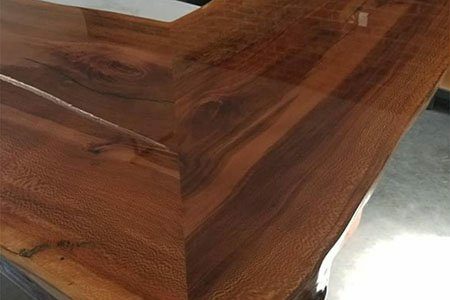 From a specialty custom perspective, we can also mill our materials to leave the ‘live edge’ bark end on the boards for an artistic and raw finish. You can see many of our live edge siding on buildings throughout the county. We are the premier source for slabs on the central coast and all around the state. 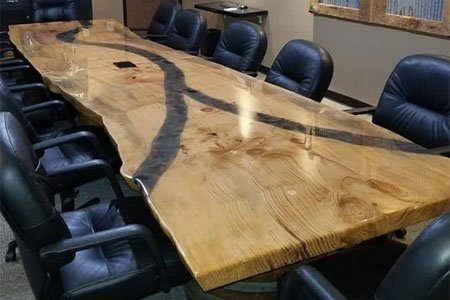 When we acquire larger sound logs we can create beautiful large slabs great for dining tables, bar tops or conference room tables. 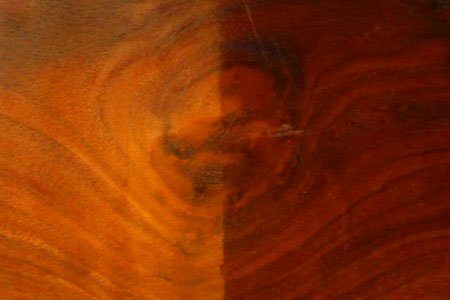 We also like to leave Mother Nature’s live edge around the circumference which shows the character and uniqueness of the material. Our slabs run from 4 feet wide and 20 feet long down to 1 foot wide and 2 feet long. Come by and see our selection. 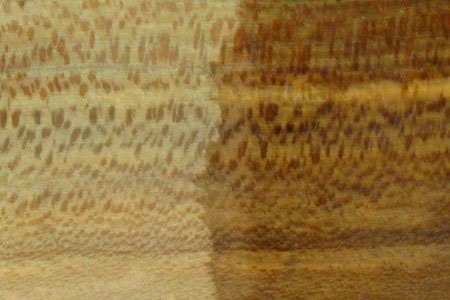 PCL provides a number of custom services for all aspects of your wood milling needs. 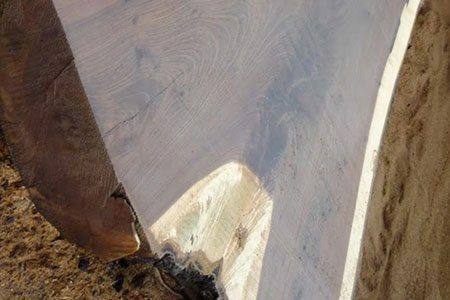 We can mill your logs or re-saw your existing lumber to your desired specifications. We can also perform shiplap milling of boards to match some existing siding templates. Typically when wood is freshly milled, it is considered “green” (high moisture content). We have a 22 feet deep and 6 feet wide Nyle dry kiln that is used for all types of wood drying needs. This kiln also sterilizes bugs and mold from wood by running above 140 degrees for several days. This is important, especially with local wood where bugs such as termites, square headed wood boards, and powder post beetles can be prominent. Also, this process “sets the pitch” for all woods, such as pine, that contain sap that can ooze. When setting the pitch, the sap liquefies and oozes from the wood and when it cools it crystallizes. 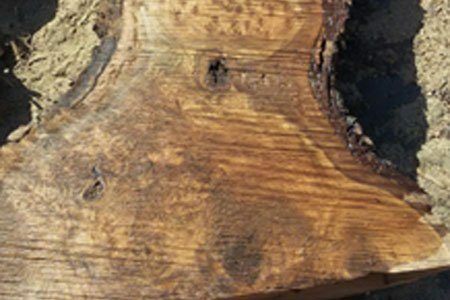 By drying the wood at 140 degrees for few days, you can be assured the wood is bug free, fully dried and the sap will not liquefy and create a mess in the future. We have two commercial planers and can plane surfaces up to 5 feet wide and 20 feet long. We have lots of wood resources to plane the PCL inventory if you are looking for custom materials or we can plane any material customers bring into the shop. We also have sanders that are used to prepare wood products for staining or sealants. No project is too big or small. 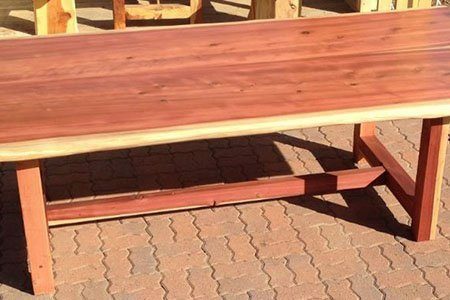 One of the many joys at PCL is crafting artistic furniture and lifestyle products using the natural beauty of wood we mill from local trees. 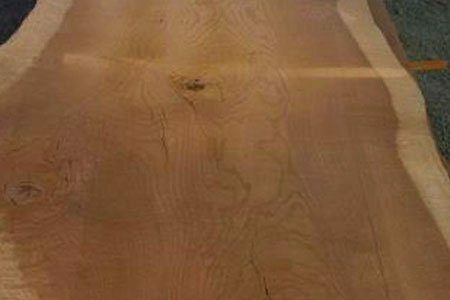 Whether you prefer a natural wood or finished surface, we have the products and services to meet your needs. From picnic tables, benches and mantles with a natural live edge, to Adirondack chairs and shoji screens, we truly have a passion for creating natural finish home and lifestyle products. 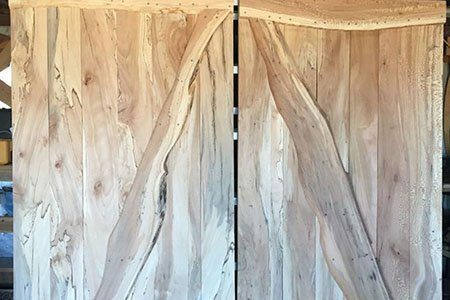 We can design and build nearly anything you can imagine from local urban forested material including tongue and groove flooring, specialty doors, wainscoting, dining tables and so much more. 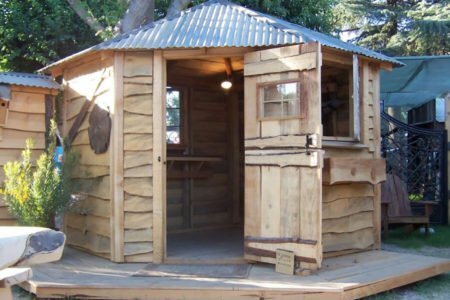 All of these products can be built from the logs we have in our inventory or from logs you provide; such as that special tree in your yard that had to be removed. We can make something beautiful and lasting so your special tree can remain in the family! PCL has the tools and expertise to hand craft stunning finished products that you will enjoy for years to come. 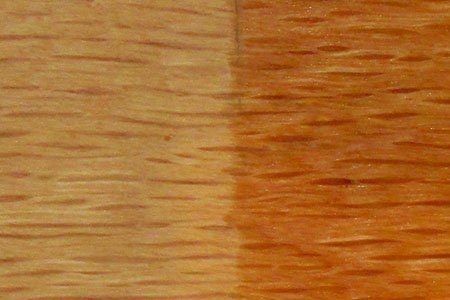 We can provide a finished surface that is stained and/or sealed for any of our natural/unfinished products. 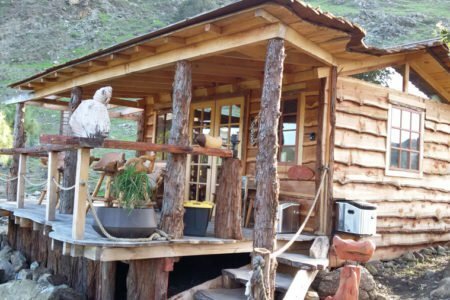 One of our hallmarks at PCL is designing and building unique cabins, retreats, he sheds and she sheds of all sizes. We utilize our urban forested lumber and unique design skills to adorn your structure to suit your style. We work closely with our clients to understand their vision and style, whether it’s low key and earthy, or vibrant and colorful, we offer our comprehensive knowledge, innovative design talent and building expertise to ensure each client is happy. We don’t just say that, we are extremely proud of our work and strive for perfection.